Matthew, Well done as always. Almost makes me want to start collecting Skaven. Almost. I detect an animus towards the Skaven, Warlord. What do you have against diseased rodents? Oh sweet Horded One! Love-love it! Skaven are my all time favourite GW race. Throt the Unclean etc are fantastic miniatures. The orcs will always have a special place in my heart, because I love their cheery, violent stupidity. But Skaven are a close second for me. The one race for Warhammer I once thought collecting an army for. They look all so diverse, while still keeping a similar style. Thanks a lot for the write-up! Well done! I'm happy you liked the write-up, WW. You've summed up my argument nicely: "so diverse, while still keeping a similar style". That is just brilliant, I want to know more of this kind of stuff! Glad that someone would consider my musings educational! The Skaven have always been my favorite Warhammer race. Good stuff! Some trivia: Even though their name stems from the root "scavenger," Jes himself confirmed to me at a Games Day long ago that it's correctly pronounced SKAY-ven. - Fritz Leiber's "Swords of Lankhmar" (1968). Fafhrd and the Gray Mouser are hired to protect Lankhmar's grain fleets, which leads them to encounter hordes of underground intelligent, scheming rats. Council of 13, elite white rats, lots of other ideas that found their way into the Skaven. - Michael de Larrabeiti's "The Borribles" (1976). The Skaven-like Rumbles are parodies of the Wombles of Wimbledon Common. - Other possible influences: Wererats in D&D. James Herbert's "The Rats" (1975). The movies "Willard" (1971) and "Ben" (1972). Richard O'Brien's "Mrs. Frisby and the Rats of NIMH" (1971). Stephen King's "Graveyard Shift" (1970, collected 1978). Jules Verne's "Adventures of the Rat Family" (1893, collected 1910). The Groundlings in "Thundarr the Barbarian: Secret of the Black Pearl" (1980). Jeff, these are all really brilliant observations - thanks so much for making a note of them! Someone else mentioned to me that the movie The "Secret of NIMH" (1982) was probably also an important influence. Fantastic, I think you've really put the finger on why Goodwin's skaven still have the same appeal now 30 years later. Amazing what Goodwin did, no. And then he went and hit it out of the park again with the Eldar. Great overview, and the gang up top look supurb. "The spectre of poverty", nice turn of phrase, it's interesting that in their dishevelled state, they are the most materially advanced civilisation of the Warhammer world. That kind of juxtaposition is solid gold (or warpstone, as the currency of choice). I think the Skaven represent the first force that Citadel truly used to start world-building. I know there are stories behind each of the Regiments of Renown, and some of those inter-linked but these were both reasonably 'tacked-on' to an already firmly established fantasy trope, and not widely explored within the miniatures themselves. 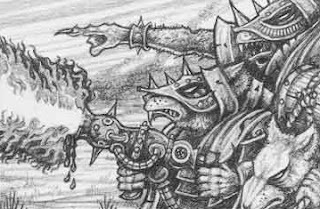 With the Skaven we not only get the background of hierarchy, clans and specialism but we also get the miniatures to represent that. What Jes gave us in terms of visual design is not only the physical expressions of Skaven warrior types, but a complete graphic language and material culture as a coherent, conceptual whole. I don't think we really see that level of complete world-building again until Jez work on the later Rogue Trader Eldar (in WD127), but it encapsulates the creative potential within an 'army' structure, which while now commonplace only later becomes the dominant expressive form of Warhammer. 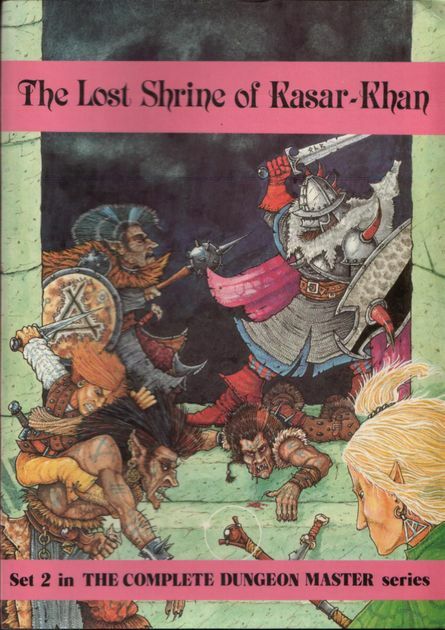 One bit of trivia - the Skaven triangle symbol appears in Jez earlier cover for The Lost shrine of Kasar-Kahn(1985), on the shield of a goblin. I think your use of the term "material culture" is bang on. When you look at the knives, shields, standards and clothing for the Skaven (both in pictures, miniatures and illustrated marginalia), you really do get a sense of a full-realized society with a coherent ethos. Good stuff, looking forwards to seeing more. If I had done Warhammer, I think I would have gone Skaven. I would have loved to see what you would have done with the Skaven, Barks. Fantastic read and wonderful minis, jaw dropping! I am so glad that you liked it, Suber. 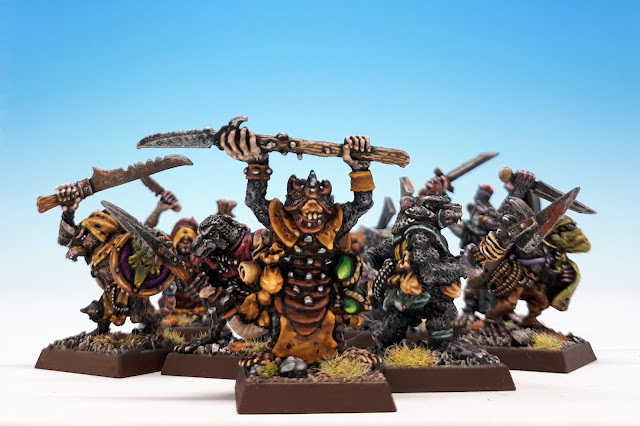 If only GW had gotten around to truly creating Space Skaven, we might have seen some of the ratmen in the Ballads of War. Nice summary. I have that citadel journal, I remember reading the background and looking at the illustrations. Everyone in our gaming group wanted skaven because of it. 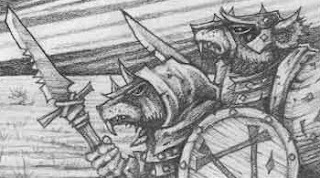 I never made the connection to Splinter and always thought of the Skaven as one of the truly unique Warhammer races. Even after all these years, reading that Citadel Journal still makes me want to field a skaven army! I've never been a big fan of the skaven, but those early models were amazing and some of the best they've ever produced. Thanks so much for this article! I think you're right to especially distinguish the early Skaven. I find the later Skaven (even though many of them were sculpted by Goodwin) to be less interesting models. Matthew, you posted this just a few days after I accidentally unearthed my Skaven Blood Bowl team from a box in my parents' basement, reminding me again of the joy that team brought me back in the day. That is so exciting to dig up a long lost treasure like that. I'm happy for you, Peter. And not only all that, but they give us the best looking bloodbowl team of all time (2nd ed skaven - Goodwin, naturally). Great article, Matthew. That's right. See Peter's comment above -- he just found his old trove. Love yours. The scheme fits perfectly with the image I have in my head for how the Skaven should look. Well I hope you get around to painting some of them soon. You can't leave all the fun to your son. 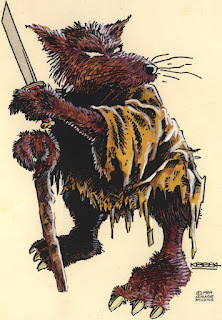 Okay, so I know full well that I'm probably going to condemn myself in a lot of people's eyes by even admitting awareness of what I'm about to talk about, but I can't help but wonder if the Urt People from John Norman's Gor novels may have been one of the ancestors of the Skaven. As much as it's ridiculed (at best) today, the Gor series did have its influence on the early gaming scene (Dave Arneson was a noted Gorean, and Judges' Guild borrowed liberally from the setting for their material). Urts are essentially the Gorean equivalent of rats, and most strikingly, the Urt People are noted to repeat much of what they say twice, just as Skaven are described as doing. As far as I can tell, their first appearance was in Players of Gor, which was published in 1984, so it's possible. I am so happy that someone has finally brought up GOR. I read so many of those Gor novels as a teen! Really opened up my burgeoning rpg GM'ing mind! A very nice read that celebrates the Master Race. In my opinion Jes' original Skaven are simply the finest sculpts GW ever produced. 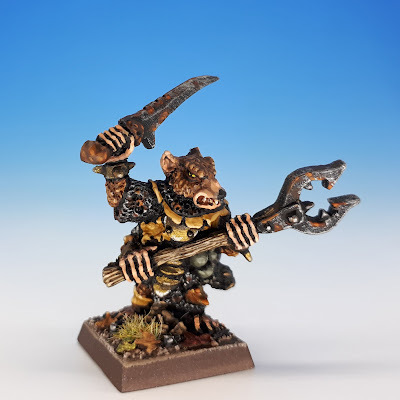 His later Skaven (4th Ed onwards) were too big and clunky (most were bigger and far more muscular than humans) and no one else has ever managed to come anywhere close in later ranges. As for their history you have encapsulated things perfectly. My only observation that I would add is that I think they're supposed to be so horrific because they're a twisted version of real human society. They're not a "what if" like Dark Elves or Chaos, they're a "we did". Orcs are obviously Humans stuck in Barbarism and Undead are the thing that goes bump in the night. Skaven though are the worst parts of human society that DOES happen, the bits we shun and don't want admit to. A great article and a big thumbs up from this paw. I completely agree with the later sculpts really losing it. "Big and clunky" just about nails it. For me, the whole 1990 style of sculpting at GW proved the adage that more is often less. And that's a great observation about Skaven reflecting the worst of human society: clannish, fond of genetic manipulation, burdened by ritualism and enslaved to an unhealthy technology. A very thoughtful article, it was a delight to read. Skaven were, I'm pretty sure, my second miniatures purchase from my childhood. I'd bought the Citadel Journal in a tiny model shop and was instantly captivated. Don't you just wish Citadel had kept up with those large format Journals! "It's like Athena bursting full grown from the head of Zeus, if Athena was an anthropomorphic rat and Zeus was a 26 year-old from Essex." Lol, as always you have a way with words :D. Great article, I never cared for the Skaven, but I think I have a whole new appreciation for them now. Thanks Allison! It took me a little while to figure out how old Goodwin was when he developed the Skaven. But fortunately, he mentioned in an interview that he was born in the year of the Metal Rat (har, har), so I was able to do some quick calculations. Very cool article and great painting. There is something special about the Skaven, and I'm thrilled to see you taking on the Vengeance of the Lichemaster project. I've been out of the loop for a while! I need to get back to painting my own Skaven. I got frustrated when I found I couldn't make mine look like Andy Chambers'. Amen brother Mouse, I think every Horned Rat worshipper has tried to get Andy's particular Skaven look and gotten frustrated. Bloody annoying. I feel EXACTLY the same way about Skaven. I'm always disappointed with my own results. I think painting them requires a quick, violent and dramatic approach to drybrushing, and I'm too cautious to pull it off. Anyway, Mr. Mouse, I'm glad your new gaming space is sorted. I look forward, perhaps, to seeing some of your own Skaven.